Following on with all the Christmas post, because it is the Christmas season, and Christmas impacts us all in many ways, I'd thought I'd share one last Christmas themed activity post with you all before I sign off for Christmas! We still have three days to go, and if you're one of those ones who're organised, and have nothing else to do apart from cook the Christmas dinner, then this post may be the one for you! Recently, I wrote a post about DIY Christmas arts and crafts, you can find that post here if you missed it, but I understand not everyone can get their hands on Christmas themed items before the big day, or maybe you're not the arts and crafts type, so I'd thought I'd introduce you to something else, we've had the arts and crafts, we've had the quizzes, we've had everything else, but what we haven't had is the Christmas games! What adult or child doesn't like a game or too? Most of us play a game on some sort of device at least once a day, I'm one of those and have my favourites which I visit first on my phone, and then when I jump on the laptop, before I even start any blog work, I always have a go or too (okay maybe some more incase Gareth's reading this) on the Poki game. When I say game above, I must be honest and say it's not a game, but rather a whole bunch of games, you name it, Poki have it! With this time of year being related to everything Christmassy, it's great to see a whole heap of different Christmas games that everyone can play, from the younger generation to the tweens and teens, to the older generation and lets not forget the young adults - like me, of course! One of my favourite games to play is the Christmas dress up, I'm so envious of the character and all the festive clothes and accessories she has! I called Spud over to my laptop once I'd finished making Elsa's cousin with her long blond hair to the side and he was quite amazed! Then he asked me if there was a special Christmas edition coming out with Elsa's cousin, so I started another game (Frozen Sisters in Disneyland) and luckily was able to get off the subject quickly! 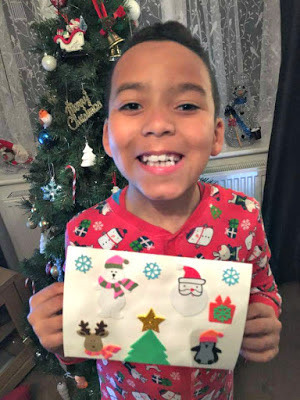 So if your children are finding themselves bored in the run up to Christmas, or even you yourself, why not try out your skills by playing a festive Christmas game?